The shrine marking the place where Jesus is believed to have ascended to heaven offers Christians a disappointing experience. All that remains of the several churches built to celebrate the Ascension is a small octagonal structure on a property that is now part of a mosque. Plain and unadorned, the Dome of the Ascension stands in a walled compound east of the main road that runs on the top of the Mount of Olives in Jerusalem. The location is just north of the Church of Pater Noster — which is built over a cave that the first Christians used as a more secluded place to commemorate the Ascension. 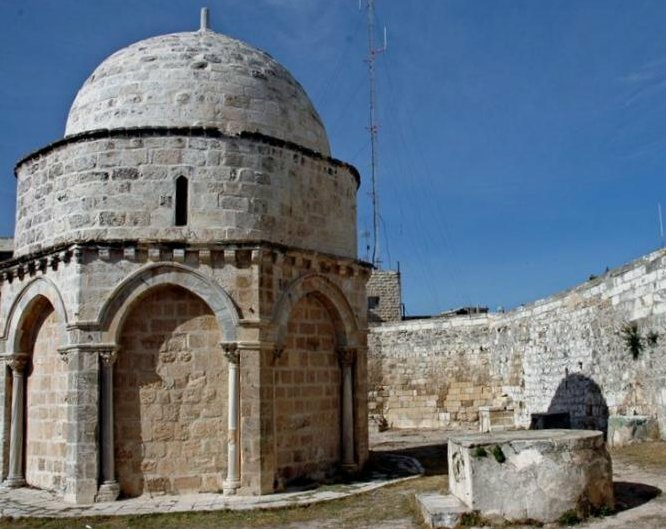 The last church on the site was captured by the Muslim sultan Saladin when he defeated the Crusaders in 1187. Since Muslims also believe in the Ascension of Jesus, it was converted into a mosque. An unusual feature of the tiny building is that it contains what has been traditionally regarded as the last impression of Jesus’ right foot on earth before he ascended into heaven. The first church on the hill was funded by Poemenia, a wealthy Roman woman who was a member of the imperial family, around AD 380. Known as the Imbomon (Greek for “on the hill”), it was a rotunda, open to the sky, surrounded by circular porticos and arches. 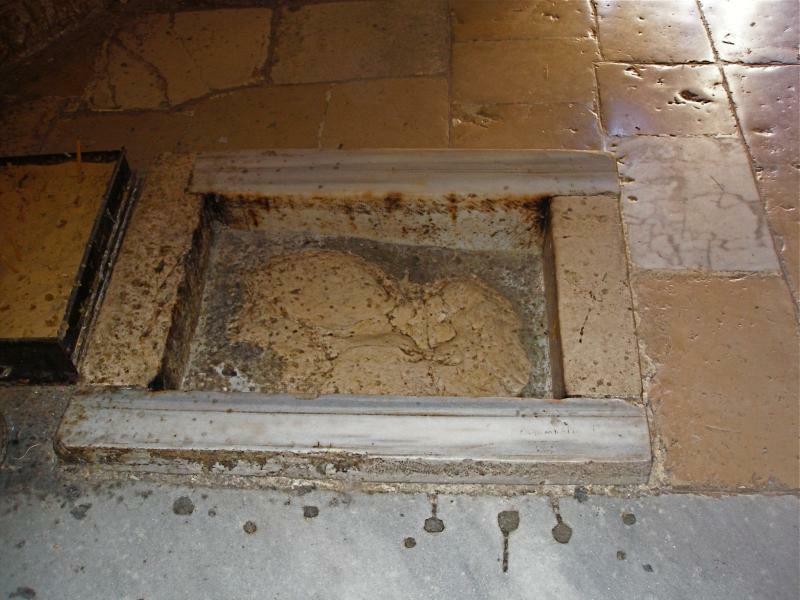 In the centre of the stone floor was a rock on which it was believed Jesus’ final footprints could be seen in the dust. By 670 the original structure had been destroyed and rebuilt but the English pilgrim Arculf reported to his countrymen that the footprints were still to be seen in the dust of its floor. In the 12th century the Crusaders rebuilt an octagonal chapel, set within a fortified monastery. From this strategic position on the crest of the Mount of Olives, the Crusaders controlled the road between Jericho and Jerusalem. The footprints were still venerated, but now they were reported to be carved into the face of the rock. Part of this rock remains today in the Dome of the Ascension, although the Muslims have moved it adjacent to a mihrab they inserted to indicate the direction of Mecca. They took the section bearing the left footprint to the Al-Aqsa Mosque on the Temple Mount, where it was placed behind the pulpit there. The Muslims also walled in the open spaces between the columns and put a dome over the opening in the roof. The ornately carved capitals on top of the columns are well preserved. The designs depict foliage and fabulous animals. The various Christian communities are permitted to hold celebrations here on their Ascension feast days. Hooks in the courtyard wall are used to erect their awnings, ribbons and flags on these occasions. To the right of the entrance to the Dome of the Ascension is a small mosque built in 1620. An underground tomb near the entrance is revered by all three monotheistic religions, although they differ about its occupant. Jews believe it contains the Old Testament prophetess Huldah; Christians regard it as the grave of the 5th-century St Pelagia; Muslims maintain it is the tomb of the Sufi holy woman Rabi’a al-’Adawiyya (for whom the mosque is named). 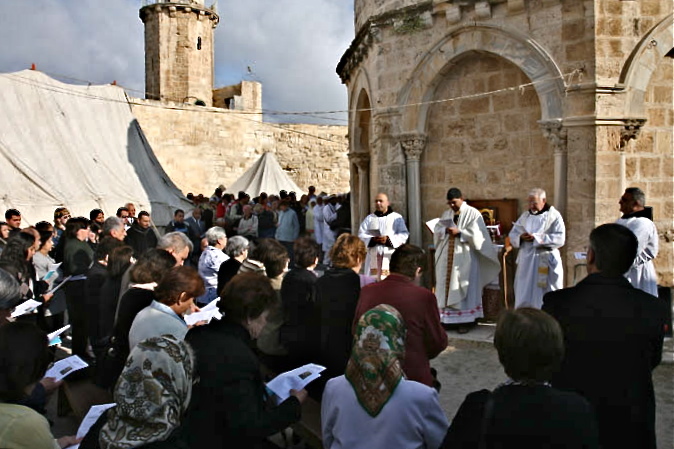 Three more recent churches on the Mount of Olives commemorate the Ascension. At the summit is the Russian Orthodox Church of the Ascension, dating from the late 19th century. Its tall tower, one of Jerusalem’s most prominent landmarks, was built to enable pilgrims to see the Jordan River. On the north side is the German Lutheran Church of the Ascension (also known as Augusta Victoria, after the wife of the Emperor Wilhelm II of Germany who initiated plans for the church in 1898), dating from the early 20th century. Its fortress-like compound with a tall bell tower now hosts a hospital for the Palestinian population of Jerusalem. Bagatti, Bellarmino: “ ‘Footprints’ of the Saviour on the Mount of Olives”, Holy Land, winter 2005.